Carrera Digital 132 tracks were launched in 2007. The new technology featured 1:24 and 1:32 scales, capabilities for up to six drivers and the ability to overtake each other at full speed. Below are some of the various resources we have found that offer layouts and plans for Carrera Digital 132 tracks. Carrera has their own page over at Carrera-Toys.com with thirty different Carrera track plans listed. Most, if not all, are real world historic race tracks. If you want to download all of them we have created a Carrera Digital 132 Tracks pack for your convenience. Usually one of the best resources for finding Carrera slot car track layouts are simple Google images searches or Pinterest searches. 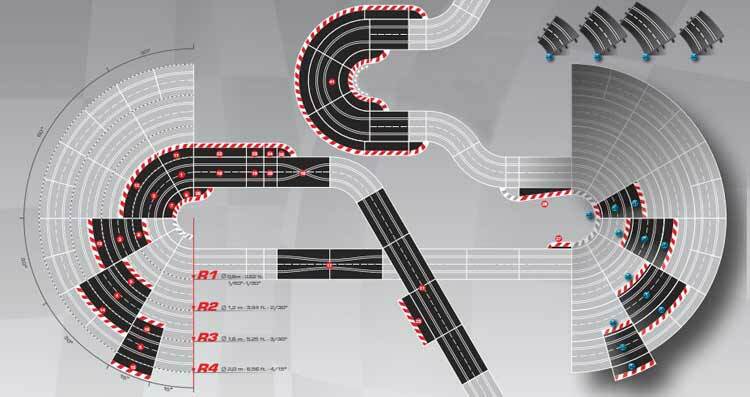 This way you can see many different track layout ideas and plans. Also, your not just seeing a digital track screenshot from some track editor but real photographs that might provide the extra detail and inspiration to build your track a certain way. Be sure to check out various slot car websites and forums as well for track layouts that have been shared. Sites such as Slot Car Illustrated will have multiple forum topics discussing Carrera layouts, here is one for starters. Cincy Slots also has a page dedicated to Carrera track plans and Ultimate Racer also has many different Carrera Digital 132 tracks listed.